Encountering a tiger at close range in the wild is an exciting experience at the best of times. For Methodist missionary Harry R. Caldwell, however, it was more than just exciting – it was truly exceptional, because that is precisely what the tiger in question was. Eschewing the fiery-furred appearance of normal tigers, this extraordinary specimen, sighted in what is now Fujian, China, must have been a truly astonishing creature to behold, because its black-striped coat was deep blue! It was during the early years of the 20th Century when Harry R. Caldwell first heard of a mystifying, almost preternatural man-eating tiger stalking the forests of southeastern China’s Fukien (now renamed Fujian) province. What made this particular killer so distinctive, however, was the local people’s vehement assertion that it was blue in colour, not the typical blazing, orange-tawny shade of typical tigers. Not surprisingly, Caldwell initially dismissed such claims as native folklore – until, while searching for this creature with his son, John, he discovered on several occasions a number of unquestionably blue-tinged tiger hairs along the mountain trails that the great cat was said to traverse. 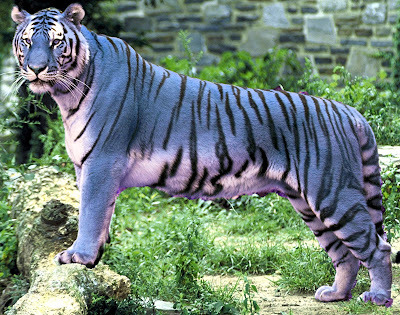 Nicknaming it Bluebeard, Caldwell decided to hunt down and kill this astounding animal, not only to rid the villages of its bloodthirsty menace but also to prove to science that at least one blue tiger really did exist. For a time, the legendary Bluebeard eluded Caldwell’s best efforts to track it down, even though, as well as being a missionary, he was also an experienced big-game hunter. In April 1910, however, he finally obtained all the proof that he needed to convince him that a blue tiger was far more than a legend – by successfully luring Bluebeard out of the forest and into view, using a tethered goat. Nevertheless, the blue tiger did not approach closely enough for Caldwell to be certain that he would kill it outright, and so he had to watch impotently as Bluebeard retreated into the forest. However, Caldwell was sufficiently heartened to repeat the ploy at a later date, when, in September 1910, after learning that it had attacked a local child, he and a companion, his native cook Da Da, found themselves sitting in hiding, waiting for Bluebeard to emerge again. "Again the cook tugged at my elbow, saying, “Tiger, surely a tiger,” and I once more looked at the object, this time to see what I thought was a man still upon his knees in the trail. I was about to turn again toward the goat when my cook excitedly said, “Look, look, it is a tiger,” and, turning, saw the great beast lengthen out and move cautiously along the trail a couple of rods and then come to a sitting position near a clump of grass. Now focusing upon what I had altogether overlooked in my previous hurried glances, I saw the huge head of the tiger above the blue which had appeared to me to be the clothes of a man. What I had been looking at was the chest and belly of the beast…The markings of the animal were marvellously beautiful. The ground colour seemed to be a deep shade of maltese, changing into almost deep blue on the under parts. The stripes were well defined, and so far as I was able to make out similar to those on a tiger of the regular type." After finally encountering at close range the mystical blue tiger that had seemed for so long to be little more than a dream, Caldwell was not about to let it fade away as dreams so often do, but as he prepared to shoot, he realised that the tiger was gazing very intently at something below in the nearby ravine. Looking down to find out what it was, Caldwell was shocked to see that the objects of Bluebeard’s attention were two boys gathering bundles of grass and ferns there, oblivious to the tiger watching them. Caldwell realised straight away that the angle at which he would be shooting Bluebeard was such that the wounded tiger would fall directly into the ravine, and its presence there, maddened with pain from the bullet, would severely endanger the children. Consequently, he knew that he had no option but to move his position, in order to shoot the tiger from a different angle and thereby ensure that it did not fall into the ravine, but first he had to draw its attention away from the children. Very slowly and cautiously, Caldwell stood up, in full view of Bluebeard – and for the next half hour, hunter and tiger stared at one another, neither of them moving a muscle. Clearly, the cat had now forgotten the children, but Caldwell knew that he still had to move position if he were to approach it from a different angle for shooting purposes. And so, reluctantly, he took his eyes off his sky-blue quarry, albeit only for a short time, as he moved away through some undergrowth – but that short time was enough. 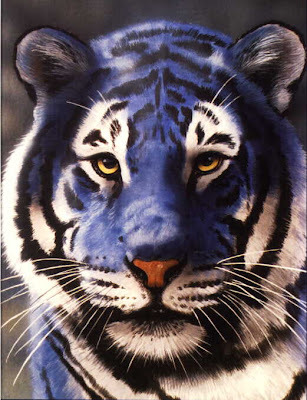 When Caldwell reached his new position, the blue tiger was no more. Like a Chinese leprechaun, Bluebeard had vanished – disappearing back into the depths of the forest, leaving behind as proof of its reality only its tracks, and also, for Caldwell, the memory of his encounter with what must truly be the most marvellous of all mystery cats. Despite continuing his searches, Caldwell was never lucky enough to catch sight of Bluebeard again. Needless to say, despite Caldwell’s well-respected status as an eyewitness, not to mention the assorted blue hairs found by him and his son, the existence of a blue tiger may seem, at least from a strictly scientific standpoint, a highly unlikely proposition. Yet, as I discovered when researching this subject while preparing my book Mystery Cats of the World (1989), there is actually a firm genetic foundation for the occurrence of such a creature. Genetically, its unusual coat colouration could be caused merely by the presence of the same two recessive mutant alleles (gene forms) - namely, the non-agouti allele of the Agouti gene and the dilute allele of the Dense Pigmentation gene - that are collectively responsible for the smoky blue-grey coat exhibited by certain ‘blue’ breeds of domestic cat – a coat colouration known as blue dilution. Moreover, there are certain preserved blue-furred pelts on record from at least two species of wild cat – the lynx and the bobcat – confirming that a mutant blue pelage can indeed occur in feline species other than the domestic cat. If there can be blue lynxes and blue bobcats, why can’t the same combination of mutant genes yield a blue tiger…or two? 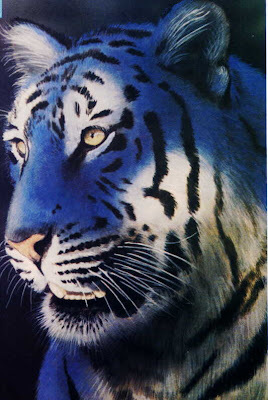 The only problem with this 'blue dilution' identity for the blue tiger is its black stripes, which wouldn't be so dark if the latter identity were correct - unless of course the stripes were not actually black but only appeared so to Caldwell due to lighting conditions at the time of his sighting; or, if they were genuinely black, are of polygenic creation, i.e. they are due to the action of modifying genes functioning independently of the combined effect of the non-agouti and dilute alleles. Whatever the answer, the blue tiger must surely be the most aesthetically appealing cryptozoological cat ever reported. Indeed, Bluebeard may not even have been unique. I have learnt of “a blue-grey tiger with black stripes” having been reported in a Chinese town given as Lung-tao. This locality may either be Lungyao, a town in southwest Hopeh province, or (taking into account Chinese pronunciation and the new phonetic convention for spelling Chinese names) Longdu, in China’s Jiangsu Sheng province. 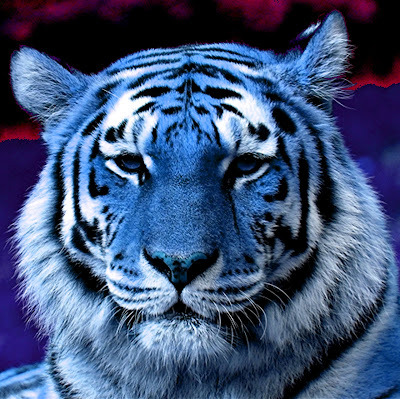 Furthermore, an American correspondent, Bill McKee, informed me in 2001 that while serving with the US army in Korea during the Korean War, his father, Lt Col. James McKee, claimed to have seen a blue tiger in the mountains one morning in December 1952, and that the locals were also aware of it. His father was stationed in central Korea, near what is now the Demilitarised Zone, and his sighting occurred about a mile to the east of the Mong Don Ni Valley. 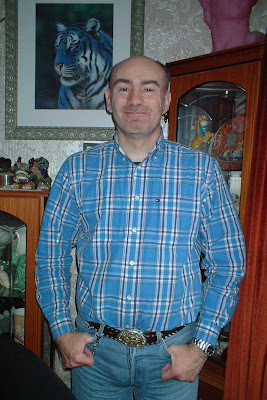 The two spectacular blue tiger paintings included here were specially prepared for me by highly acclaimed wildlife artist William Rebsamen, and I am both proud and honoured that the original, signed version of the blue tiger profile painting was kindly given to me as a gift by Bill a few years ago - thanks Bill! 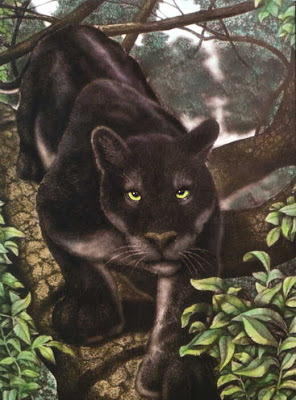 For more information on blue tigers and other controversial colour morphs of big cats, be sure to check out my forthcoming full-colour book, Cats of Magic, Mythology, and Mystery, due to be published by CFZ Press in late 2012.
Who stands ‘neath the eaves draped in shadows? 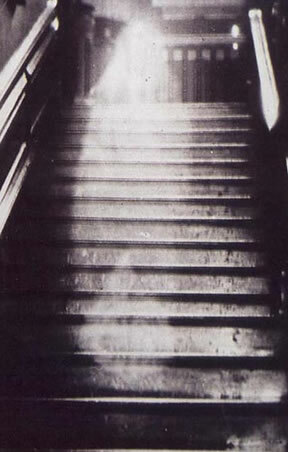 Who dwells ‘midst the darkness of Night? Rhyme lacking in reasonless rhyme. In Morning’s pale sun-shadowed dawn. As I through all kingdoms am borne. In pools’ depthless doorways of Light. A phantom transparent in Space. An infant before the All-Seeing”. During several years of persistent field research, Peruvian zoologist Dr Peter Hocking has gathered convincing anecdotal testimony concerning at least four different kinds of mysterious Peruvian big cat all currently unrecognised by science. One of these, reported from Peru's Ucayali and Pasco provinces, is particularly distinctive, because not only is it as large as a jaguar, but also it is said to be striped, just like a tiger. There is no known species of striped cat indigenous to South America, but reports of a large, highly elusive species of striped cat have previously been documented from Colombia and Ecuador. These latter reports are thought by some cryptozoologists to be evidence for the existence of a living species of sabre-toothed cat. The second Peruvian mystery cat, known to the Amuesha native hunters and inhabiting the lower Palcazu River valley in Pasco province, is equally remarkable. It too is as large as a jaguar, but instead of possessing the jaguar's characteristic rosette markings, its entire body is uniquely patterned with solid black speckles. For this reason it has been variously nicknamed the speckled or mottled jaguar. Intriguingly, this description is reminiscent of another, equally cryptic cat, reported from Brazil and Guyana, and referred to by the Wapishana Indians as the cunarid din. Peruvian mystery cat #3 allegedly resembles a giant black panther, is said to be twice as big as a jaguar, and is known to the Quechua Indians as the yana puma ('black puma'). Fully confirmed specimens of melanistic (all-black) pumas, however, are exceedingly rare, so perhaps it may be an unusually large version of melanistic jaguar instead, one whose coat markings are completely hidden by its fur's abnormally dark background colour. As for the fourth member of this cryptic quartet, Hocking refers to it as the jungle lion - for good reason. According to rangers who have reported it in the Yanachaga National Park, this mystery cat has reddish-brown fur, is lion-sized, and has long hair around its neck. The existence of four still-undiscovered species of big cat in Peru alone seems scarcely conceivable, even in this modern age of unexpected zoological surprises (such as the several notable new species of New World monkey, marmoset, and other mammal already discovered in South America during the 1990s and 2000s). Some may merely be unusual mutant forms of known species. However, Hocking's amassed evidence is not limited entirely to the anecdotal variety. In 1993, Hocking procured from Indian hunters the skull of what was said to be a female specimen of the striped mystery cat, which has since been passed to felid specialist Dr Steven C. Conkling for study. Moreover, he has also obtained the skull of an alleged 'speckled jaguar', which has been examined by a number of American zoologists, whose verdict is that it is notably different from the skull of any known cat. Spurred on by these finds and comments, Hocking is continuing his search for physical evidence, such as pelts and, ultimately, entire carcases, with which to ascertain once and for all the true taxonomic identities of these feline riddles from Peru. Nor is that the end of possible feline discoveries to be made in South America. During a year-long expedition through Brazil in 1996-7, Dutch primatologist Dr Marc van Roosmalen - personally responsible for discovering most of the 1990s' and 2000s’ extraordinary number of new South American primates, as well as the giant peccary, dwarf lowland tapir, pygmy manatee, and other remarkable new mammals in South America - spied what he claims to be a new species of jaguar. He described it as being predominantly black, but readily distinguished from normal melanistic specimens by virtue of a distinctive white collar-like patterning around its throat, which he likened to that of the Brazilian giant otter, and also a lion-like (i.e. bushy-tipped?) tail. Peruvian mystery cat investigator Dr Peter Hocking has also been following up reports of a mysterious 'mega-monkey'. Several totally new species of monkey have already been discovered in South America during the 1990s, but according to Hocking a very spectacular example may still await formal disclosure in Peru. Referred to by the local Indians as the isnachi as well as by several other names too, their descriptions of it call to mind a monkey with a body as large as that of a chimpanzee, but with a baboon-like face, and a short tail. They also claim that it is rare but very fierce, so they avoid it whenever possible. FINE FEATHERED FICTION - OR FACT? Some highly controversial birds have been reported from South America. Notable among these is the glaucous macaw Anodorhynchus glaucus. This beautiful species, resembling the larger, famous hyacinth macaw but with sea-green shades to its plumage as well as the deep cobalt hues of its larger relative, was formally described in 1818, and seemingly had a wide distribution across this continent. Yet by the end of the 1800s, it had apparently become extinct in the wild, with just a few specimens left in captivity. In recent years, however, a number of odd-looking, sea-green-feathered birds officially deemed to be hyacinth macaws (or, in some cases, the slightly smaller, turquoise-tinged Lear's macaw) have turned up in aviaries around the world, which some experts claim to be bona fide glaucous macaws. One of the most noteworthy examples was a distinctive specimen imported into Britain by parrot breeder Harry Sissen in February 1992, on loan from France's Mulhouse Zoo, under the impression that it was one of a pair of Lear's macaws. Nevertheless, none of these has so far been confirmed as glaucous macaws - but if any are, this suggests that somewhere in the wilds of South America is an undiscovered population of this elusive, mysterious parrot. The salt lakes beyond the Atacama desert in the high peaks of the Chilean Andes harbour three different types of flamingo - officially. Unofficially, however, there may be a fourth, still-undiscovered type. The local Indians inhabiting this region refer to the three known flamingos as the tococo (Andean flamingo), guaichete (Chilean flamingo), and chururo (James's flamingo) respectively. However, they also distinguish an additional type, which they speak of as the jetete. Bearing in mind that the breeding grounds of James's flamingo in this remote, scarcely accessible locality remained hidden to science until as recently as 1957, it would not be impossible that a new flamingo does indeed linger undetected here. Also worthy of investigation are reports of a peculiar type of guan gathered by Peruvian zoologist Dr Peter Hocking. Guans are gallinaceous birds distantly related to pheasants and grouse, but found only in the New World. Numbering several different species, they generally possess fleshy facial wattles. However, rangers working in the Yanachaga National Park, in Peru's Pasco province, have informed Hocking that an all-black form of guan occurs amid the park's higher elevations that does not possess any wattles at all - unlike the known species of black guan, Aburri aburria, which also occurs in this park but only at lower elevations. Just a freak, wattle-lacking version, or a new species awaiting disclosure? 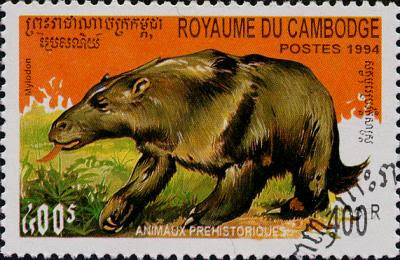 During the 1990s, the place to be for any enthusiastic cryptozoologist was Indochina, especially Vietnam and neighbouring Laos, where an extraordinary number of large new hoofed mammals and other species have been sensationally revealed to scientists. If the ongoing investigations of Drs Hocking, van Roosmalen, and Oren prove successful, however, we may well be looking to Peru and Brazil as the hotbeds of major cryptozoological revelations during the opening decades of the 21st Century. A few blogs ago, I noted that the ITV sci-fi series ‘Primeval’ is one of my all-time favourite television shows. And many of you know that I am currently working upon an expanded, updated version of my 1995 cryptozoology book In Search of Prehistoric Survivors. Consequently, I could not be anything but greatly intrigued to stumble upon an internet article recently that was entitled ‘Primeval Survivors?’ – and, reading it, I was certainly not disappointed. As you’ll see if you access it in issue #38 (April 2009) of the online teenage magazine Flipside Extra – at http://www.flipside.org.uk/38/primeval.cfm and published by the Institution of Engineering and Technology - the article in question deftly utilises the excellent ‘Primeval’ TV series as a means of introducing cryptozoology, including the possibility that there are undiscovered prehistoric creatures lurking in the modern world (and without needing access here via any Anomaly), my own cryptozoological views, and those of science journal Nature’s editor, Dr Henry Gee, who looks upon cryptozoology in a positive light. All in all, then, a pleasant surprise indeed! BTW, I’m still considering ideas for the title to my book’s update. 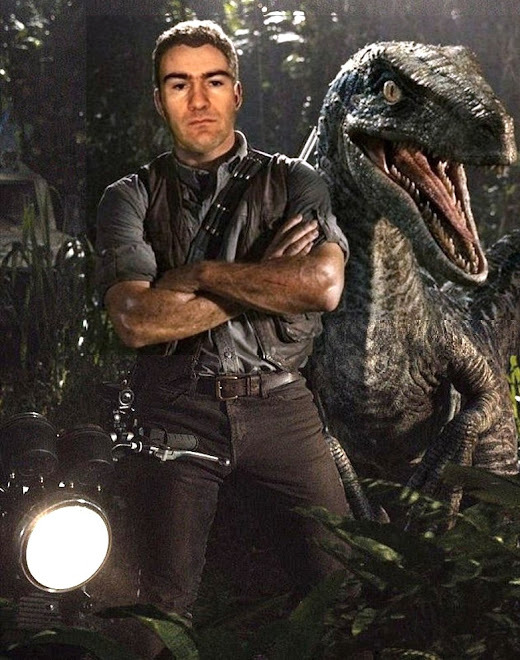 How about In Search of Primeval Survivors?! Now there’s a thought! Back to the present, however, and herewith my latest blog post – the first of a two-part account regarding some of South America’s cryptids. These will include some mystery birds, so if you’re interested in them, check out the current issue of Paranormal Magazine, which has an entire article on crypto-birds by me. SUCURIJU GIGANTE - OR, BEWARE OF THE SERPENT! Immense anacondas may seem fanciful to western science, but they are apparently very real to the Indian tribes inhabiting riverside localities within the 'green hell' of Amazonia, who even give these oversized serpents their own specific name - sucuriju gigante. Some reports seem too incredible to be taken seriously, yet have been vehemently championed by eyewitnesses to the events in question. 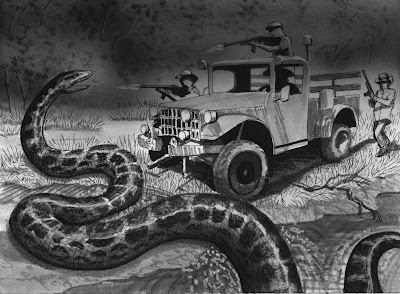 Thus, in 1948 a stupendous anaconda emerged from the River Oiapoc in Brazil's Guapore territory, and hid itself within the fortifications of Fort Tabatinga - until it was finally dispatched by a hail of at least 500 machine-gun bullets fired by a team of soldiers sent to kill it. According to an illustrated report of this incident later published in a Rio de Janeiro newspaper, when its colossal carcase was measured this monstrous snake was found to be 115 ft long! How accurate this claim is, however, will never be known, because after they had killed it the soldiers pushed the anaconda's body back into the river. "It measured 50 ft for certainty, and probably nearer 60. This I know from the position in which it lay. Our canoe was a 24 footer; the snake's head was 10 or 12 ft beyond the bow; its tail was a good 4 ft beyond the stern; the center of its body was looped up into a huge S, whose length was the length of our dugout and whose breadth was a good 5 ft."
There are certain fundamental problems facing anyone attempting to assess reports of giant snakes. Eyewitnesses tend to be notoriously inaccurate when estimating the length of a long snake - especially one that is coiled up. Evidence supplied in the form of extra-lengthy snake skins is of little value either, as skins can be stretched quite considerably. As for photographs purporting to show giant snakes, these rarely contain any scale by which the reptile's size can be determined. And, for obvious reasons, the prospect of capturing and bringing back for scientific examination a living specimen of a serpentine giant is a daunting one to say the very least! Nevertheless, the likelihood of anacondas existing that do exceed 30 ft, and possibly quite considerably, cannot be ruled out of hand. If the anaconda were a terrestrial species, giant specimens would be highly unlikely, simply because they would be too heavy to move efficiently. As the anaconda is primarily aquatic, however, its body weight - even if fairly immense - would be effectively buoyed by its surrounding watery medium, thus permitting it to grow to sizes far in excess of anything that a land-living serpent could emulate. 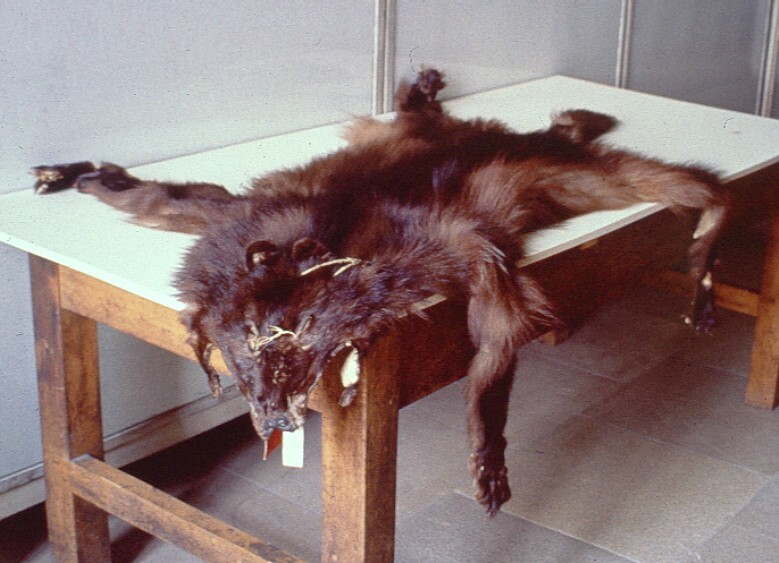 The pelt depicted below is currently unique - the only preserved example of a pelt from the elusive, still-controversial Andean wolf. It came from a market in Buenos Aires, where it and three others just like it were spotted by German animal dealer Lorenz Hagenbeck in 1927. After learning that it was from a strange form of dog allegedly inhabiting the Andes, Hagenbeck purchased this pelt - the fate of the others is unknown - and brought it back to Europe, where it is now housed at the Zoological State Museum in Munich, Germany. Perplexed scientists examined its luxuriant, dense pelage, unlike anything previously documented, and proposed that it originated from an as-yet-undescribed, mountain-dwelling version of the maned wolf Chrysocyon jubatus. German zoologist Dr Ingo Krumbiegel paired it with an equally mysterious canine skull of Andean origin, and in 1949 published a paper in which he formally described this reclusive, montane-adapted maned wolf, and subsequently named it Dasycyon hagenbecki ('Hagenbeck's thick-furred dog'). No sightings or further specimens of this supposed new species, however, have ever been recorded. Hair analyses later suggested that the pelt may be (or may at least be descended) from a domestic sheepdog, but this identity of a wolf in sheepdog's clothing has not been confirmed. During the late 1990s, Guillaume Chapron, a member of the IUCN/SSC-Veterinary Specialist Group, expressed an interest in researching the Andean wolf during some planned field work in Argentina, but again there have been no further developments to date. Every so often, an unexpected, unheralded upheaval of land occurs in Uruguay and in Parana, southern Brazil, substantial enough in some cases to have caused the collapse of roads and hillsides, and even the diversion of river courses. Even so, this could be dismissed as nothing more than an earth tremor or suchlike - were it not for the amazing fact that a bizarre subterranean creature sometimes reveals itself during this subsidence. Described by eyewitnesses as resembling a huge worm, but with a pair of small stubby horns on its head, and covered in black scaly skin, it is generally referred to as the minhocão (see an earlier blog of mine for a detailed account of this cryptid). Over the years, many attempts have been made to offer a zoological identity for this cryptic beast - ranging from a giant lungfish to a surviving species of gargantuan armadillo-related prehistoric mammal known as a glyptodont. As I have proposed in previous publications and also in a previous ShukerNature blog post, however, the minhocão's description and behaviour corresponds closest to what one would expect for a giant species of caecilian - a limbless, worm-like, burrowing amphibian, which sometimes does have a pair of small tentacles on its head, and skin embedded with small scales. For a number of years, Brazilian zoologist Dr David Oren, from the Goeldi Museum, has led expeditions into the dense jungle heartland of the Mato Grosso in search of an extraordinary mystery beast known to the local Indians as the mapinguary. According to their description, it is covered in reddish fur, stands as tall as an average adult human when squatting on its hind legs, leaves peculiar footprints that look as if they are back-to-front and other, equally strange bottletop-shaped impressions, emits a loud shouting cry, defecates horse-like droppings, and is claimed to be invulnerable to bullets. Rather more bizarrely, they also claim that it gives off a foul, lethal stench to ward away would-be attackers, and has a second mouth in its stomach! Despite its grotesque-sounding appearance, Oren is confident that although he has yet to observe a specimen, he has at least determined the mapinguary's identity - stating that he believes it to be a surviving species of mylodontid ground sloth. Officially deemed to have become extinct several thousand years ago, various mummified specimens have been discovered in sealed-away caves. These reveal that they did indeed have red fur, feet that could leave footprints which may appear reversed to anyone unfamiliar with ground sloth foot structure, and a powerful tail whose tip, if used for support while squatting upright, could yield the strange bottletop prints. Moreover, preserved mylodontid faecal pellets that do resemble those of horses have also been found, as have preserved mylodontid pelts, which contain bony nodules that may actually deflect bullets and other missiles. As for the mapinguary's stench emission and stomach-sited 'second mouth': Oren proposes that a specialised scent gland may be present on the mapinguary's belly, releasing a vile skunk-like gaseous odour as a defence mechanism. 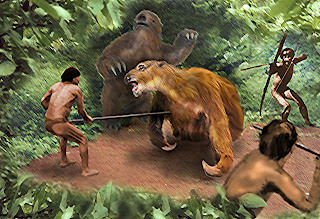 If the mapinguary is indeed revealed one day to be a living ground sloth, it may well comprise the largest species of mammal native to South America - and hence a major cryptozoological success story. One of South America's least-known creatures of cryptozoology is the enigmatic water beast reported from Peru's mighty Lake Titicaca in 1910 by Adolph F. Bandelier, within his book The Islands of Titicaca and Koati. According to Bandelier, a 12-ft-long animal variously said to resemble a manatee or a seal has been sighted near the islands of Tiquina and Titicaca, and also close to the peninsulas of Tiquina and Copacavana, in Lake Titicaca. As yet, however, no formal verification of its existence, let alone its identity, has been forthcoming. Equally obscure is the formidable mystery beast reported from the Paraguayan Chaco region in 1954 within the autobiography of Charles W.T. Craig, entitled Black Jack's Spurs. The locals claim that this weird-sounding creature resembles a slug-like serpent, but sports the head of a dog, a poisonous barbed spike in its stumpy tail, and is as broad as a horse. Veteran cryptozologist Dr Bernard Heuvelmans opined in 1986 that it could be a form of giant catfish known to the locals as the manguruyu. Moreover, they claim that this fish can grow up to 18 ft long and weigh up to half a ton, but such gargantuan sizes have never been scientifically verified. According to Lt.-Col. Fawcett, the Paraguay River contains "...a freshwater shark, huge but toothless, said to attack men and swallow them whole if it gets a chance". However, very few shark species inhabit freshwater, and those that do are well supplied with teeth. Consequently, not all cryptozoologists who accept Fawcett's statement believe this creature to be a shark. British investigator Mike Grayson, for instance, has suggested that it may in reality be a sturgeon, some species of which do bear a very superficial resemblance to sharks and can attain a huge size. Having said that, as Grayson readily concedes, sturgeons normally do not attack and eat people (but perhaps this component of the report is based upon local superstition?). However, there is also a zoogeographical problem with this identity, inasmuch as there is not a single known species of sturgeon native to South America. My own view is that if such a creature exists and is not a real shark, it may conceivably be a giant catfish. There are more catfish species in South America than anywhere else, and some of these are also among the world's largest. Moreover, some other very big species, such as the European catfish (wels) have been accused of swallowing people (albeit, again, a claim more probably folkloric than factual), and elderly specimens of certain giant catfishes, such as the Mekong River's pa beuk, are indeed toothless. So perhaps 'Gums' (an apt name coined by Grayson for Fawcett's edentate enigma) is actually an old toothless catfish, possibly belonging to a still-undescribed extra-large species.